The little paddle steamer Sirius was considered ‘modern for her time. To think things don’t change is an illusion hence the title here. On the subject of illusions if you like what you see on these pages you will love the originals. 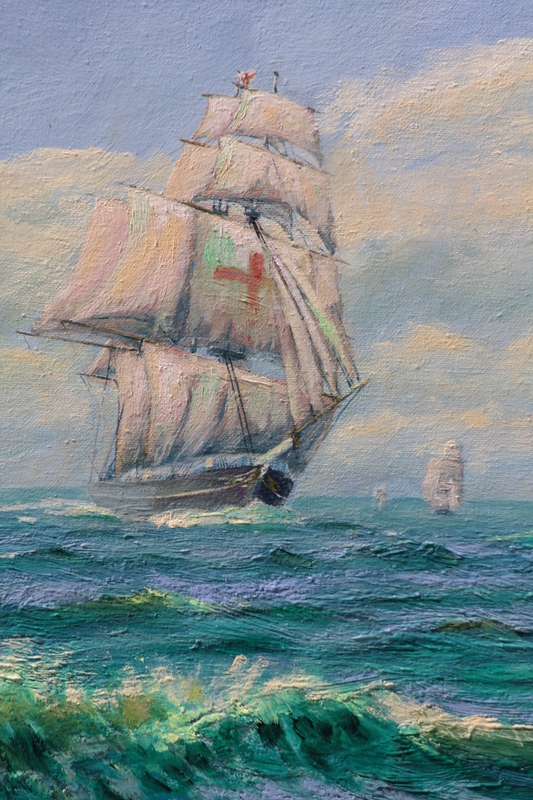 Sirius was built as a packet boat (mail ship) for the South coast of England & southern Ireland, named for the sailor’s most reliable star, the Pole Star Sirius. Sirius was hired to make an attempt on the first powered transatlantic crossing. The consortium who hired Sirius hoped to win a transatlantic mail contract from the British Government. In 1838 there were considerable doubts about the ability of steamships, many ‘experts’ considered a powered crossing impossible arguing, no ship could carry enough fuel (coal). 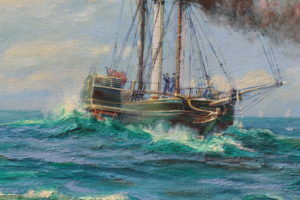 The paddle steamer (side paddler) Sirius carrying 45 passengers made the historic first ever fully steam powered crossing of the Atlantic Ocean, no sails used. Some say she was also the inspiration for the classic adventure novel Around the World in Eighty Days by the French writer Jules Verne, published in 1873. You may recall, Jules Verne’s wrote a chapter about an Atlantic crossing during which deck planking and furniture were burnt to ensure the ship reached port? 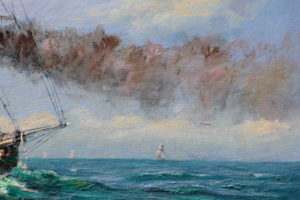 It was said of Sirius as her coal ran out, was insufficient, so her furniture and decks were burnt to ensure she got into New York under power thus Sirius probably gave Jules Verne an idea for his splendid book Round the World in 80 Days. 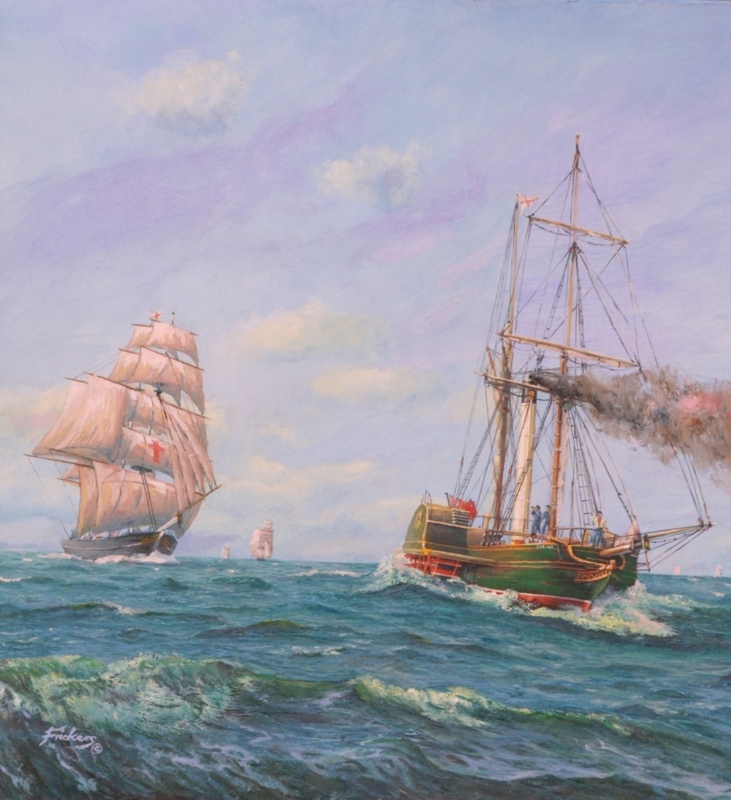 This marine painting which is available, shows the Liverpool ‘crack’ packet boat “Dreadnought” over hauling the steamer “Sirius” – but the future was with Sirius . 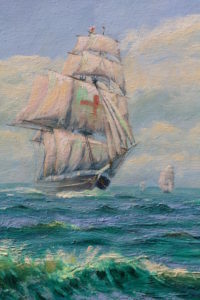 A typical Saint George’s Cross line packet the ‘Dreadnought‘ was capable of over 20 knots thus be seen here fast overhauling the Sirius which averaged a mere 8 knots. Sirius beat I.K. 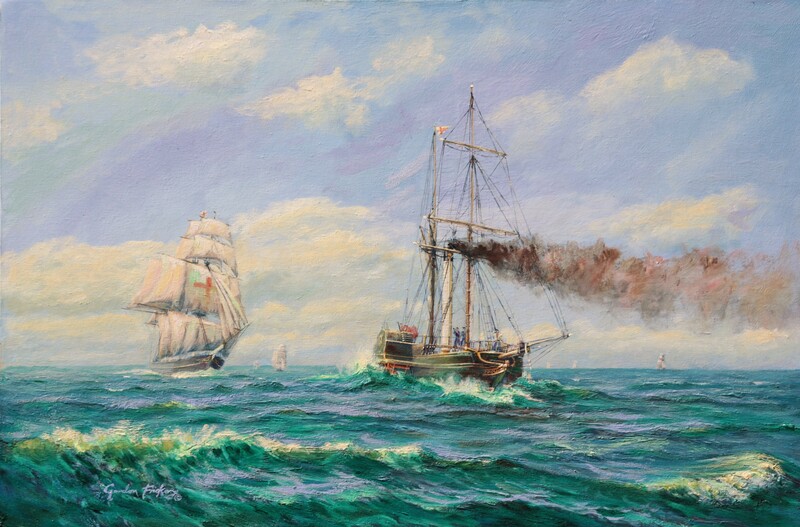 Brunel’s magnificent, innovative and much larger “ Great Western ” into New York by a narrow 4 hours thus winning a place in the history books for Sirius . 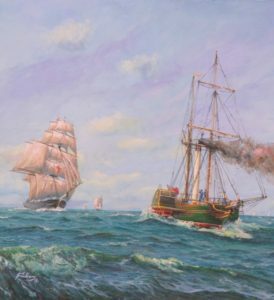 1816 saw the start of a new British American innovation, cooperation, the Black Ball Line’s ‘crack’ clipper packet ships which departed on a schedule, even if only half loaded; some crossing the Atlantic Ocean in as little as 10 days. The reliable service was an immediate success. Credit where due: My grateful thanks to the Cunard Line for taking me as a celebrity guest, as a marine artist in residence on the elegant Queen Elizabeth 2 to Cobh (formerly Queenstown) where I was allowed by the staff of the Cobh Maritime Heritage Centre to photograph the excellent model of Sirius in the Cobh Museum and thus in a modest way commemorate some of the brave souls who operated ships on the stormy Atlantic called by sailor men The Western Ocean .